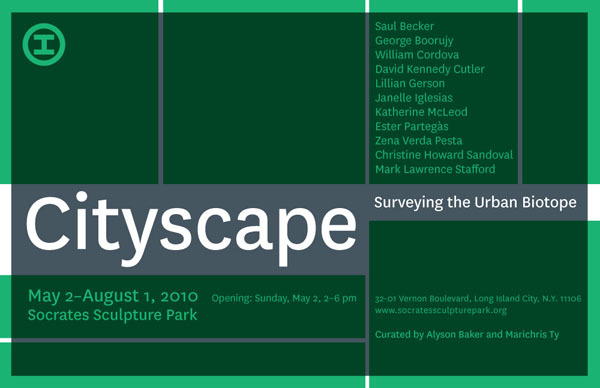 Socrates Sculpture Park is pleased to announce the opening of Cityscape: Surveying the Urban Biotope, on Sunday May 2, 2010, from 2-6pm. Curated by Alyson Baker and Marichris Ty, the show will explore the presence of nature in the fabric of urban life. Cityscape includes eleven new works by artists: Saul Becker, George Boorujy, William Cordova, David Kennedy Cutler, Lillian Gerson, Janelle Iglesias, Katherine McLeod, Ester Partegas, Zena Verda Pesta, Christine Howard Sandoval, and Mark Lawrence Stafford. The introduction or invasion of plants and animals in the cityscape symbolizes a broad scope of conditions and dynamics — from far reaching social, political, economic and aesthetic issues to an individual’s relationship with their immediate surroundings. Nature’s presence in the urban environment can take many forms: green roofs, community gardens, city parks, corporate plazas; Peregrine Falcons nesting on 5th Avenue balconies; vast populations of rats and pigeons that have readily adapted to the habitat of busy streets; Ailanthus trees growing from crumbling buildings, abandoned construction sites, and cracks in the sidewalk. This range from invited and cultivated to invasive and insidious represents everything from the most innovative urban planning and a trend towards the greening of cities, to a symptom of and contributor to the decay of the built environment. Programming at Socrates Sculpture Park is made possible by major contributions from: Lily Auchincloss Foundation, Milton and Sally Avery Arts Foundation, Bloomberg, Charina Endowment Fund, The Cowles Charitable Trust, Dr. Jonathan T. Deland and Emme Deland, Mark di Suvero, Maxine & Stuart Frankel Foundation, Agnes Gund, Hugh & Tiziana Hardy, Lambent Foundation, Dorothy Lichtenstein, Lin Lougheed, Ivana Mestrovic, Ronay & Richard Menschel, National Endowment for the Arts, Ellen Phelan, David Pincus, Brooke Kamin & Richard Rapaport, Gabrielle H. Reem M.D. & Herbert J. Kayden M.D., Joel Shapiro, Silvercup Studios, Storm King Art Center, Mr. and Mrs. Thomas W. Smith, Janice Stanton & Ronald Windisch, Von Rydingsvard & Greengard Foundation. Additional support has been provided by the National Endowment for the Arts and the American Recovery and Reinvestment Act of 2009. This exhibition is made possible with public funds from the New York State Council on the Arts, a state agency and is supported, in part, by public funds from the City of New York Department of Cultural Affairs. Special thanks to the City of New York, Mayor Michael R. Bloomberg, Queens Borough President Helen M. Marshall, City Council Speaker Christine C. Quinn, Assemblywoman Catherine Nolan, City Council Members James G. Van Bramer & Peter F. Vallone Jr., and the Department of Parks and Recreation, Commissioner Adrian Benepe. Socrates Sculpture Park is extremely grateful for generous contributions from our many patrons, volunteers and friends, and in-kind support from Harold H Anthony, Inc, Build It Green! NYC, E & T Plastics, R & R General Supply Co., Inc., Materials for the Arts, Navillus General Contracting, Plant Specialists, Silvercup Studios, and Spacetime C.C.